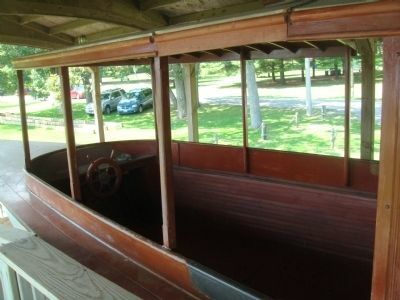 "No Hurry" was built for Victor and Jesse Lawson by Electric Launch Company of Bayonne, New Jersey in 1909. The 55 foot boat is made of cypress, white oak and mahogany and was powered by two electric motors and 140 batteries. 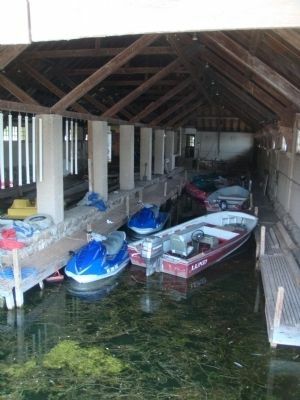 The Lawsons built the boathouse you see to your left in 1910 to house "No Hurry." 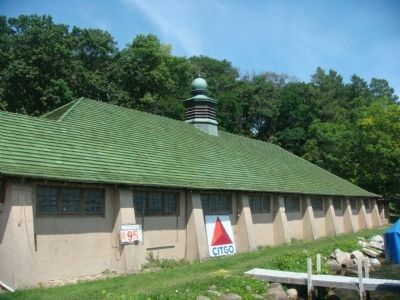 A power generating plant was also built in 1910 to provide electricity for the estate and to recharge "No Hurry." 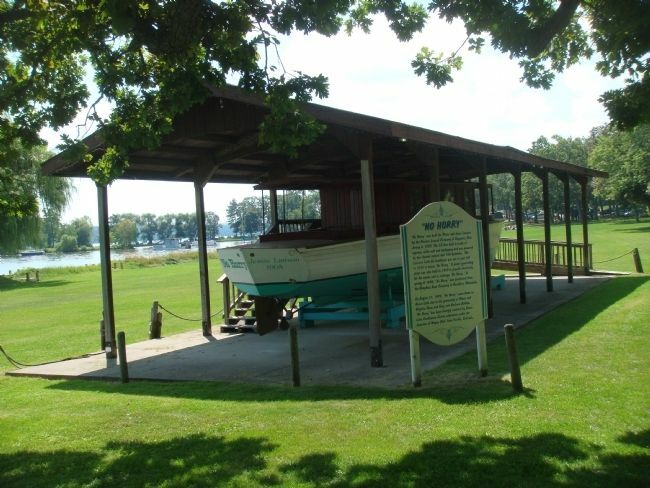 In spring of 1994, "No Hurry" was purchased from the Nimphius Boat Company in Neshkoro, Wisconsin. 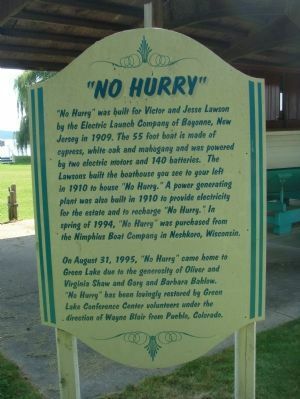 On August 31, 1995, "No Hurry" came home to Green Lake due to the generosity of Oliver and Virginia Shaw and Gary and Barbara Bahlow. "No Hurry" has been lovingly restored by Green Lake Conference Center volunteers under the direction of Wayne Blair from Pueblo, Colorado. 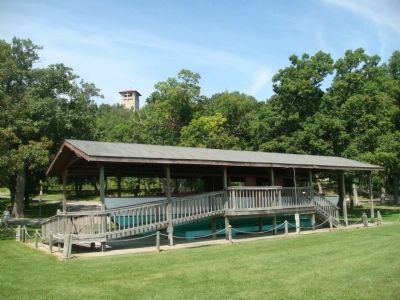 Center at W2511 State Highway 23. 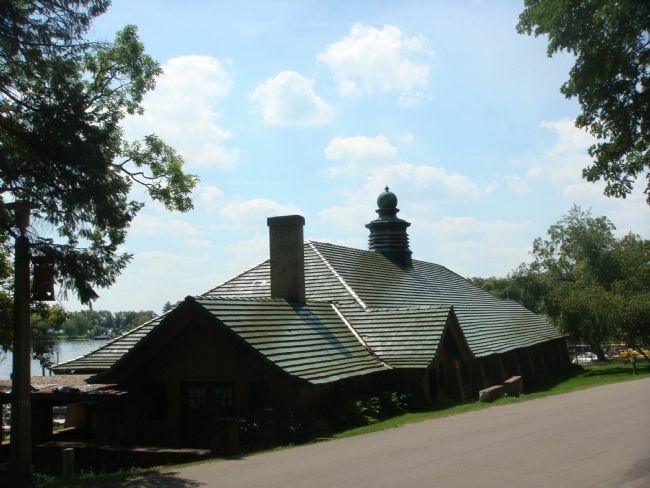 Marker is in this post office area: Green Lake WI 54941, United States of America. Touch for directions. Other nearby markers. At least 8 other markers are within 7 miles of this marker, measured as the crow flies. 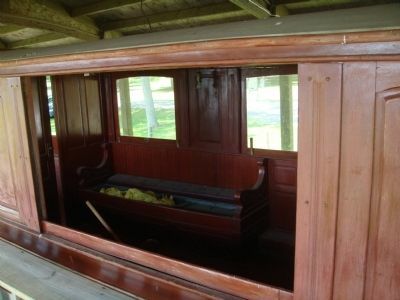 Chapel Car "Grace" (about 600 feet away, measured in a direct line); "Daycholah" (approx. 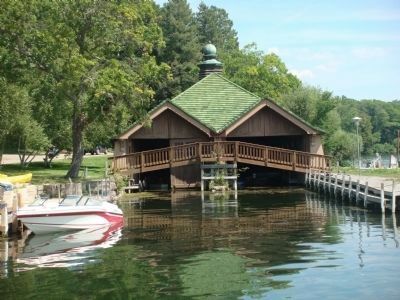 3 miles away); Dartford–Green Lake Dam (approx. 3.3 miles away); In Memory (approx. 3.3 miles away); Veterans Memorial (approx. 6.2 miles away); Princeton War Memorial (approx. 6.2 miles away); American Legion Post 366 War Memorial (approx. 6.6 miles away); Princeton Cattle Fair (approx. 6.7 miles away). Touch for a list and map of all markers in Green Lake. More. Search the internet for "No Hurry". Credits. This page was last revised on June 16, 2016. This page originally submitted on August 18, 2013, by William J. Toman of Green Lake, Wisconsin. This page has been viewed 419 times since then and 7 times this year. Photos: 1, 2, 3, 4, 5, 6, 7, 8, 9. submitted on August 18, 2013, by William J. Toman of Green Lake, Wisconsin.